Tankless water heaters provide instantaneous on-demand hot water, by heating water only as it is demanded. When hot water is turned on at the source, cold water travels through a pipe into the tankless unit. In a gas-fired Noritz tankless water heater, a gas burner heats the water. This allows tankless water heaters to supply a constant flow of hot water and when sized correctly they are able to supply enough hot water for simultaneous, multiple uses in both residential and commercial buildings. A hot water tap is turned. Next, water enters the heater. The water flow sensor detects the strength of the water flow. 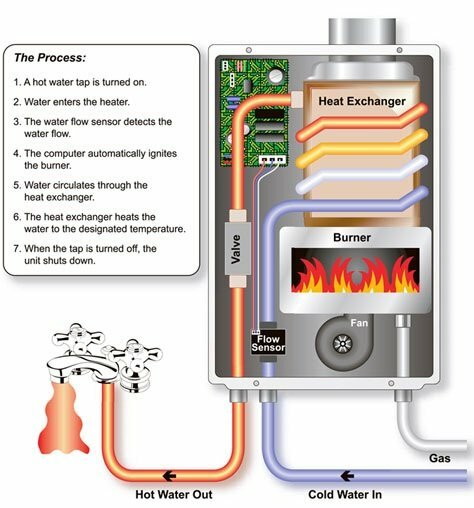 The water heater’s computer automatically ignites the burner. Water is forced to circulate through the heat exchanger. The heat exchanger heats the water temperature to the set temperature. When the hot water tap is turned off, the tankless water heater shuts down. What Is A Tankless Water Heater Heat Exchanger? Since the heat exchanger is where the water is heated up by the Noritz dual flame burners, it is also where most of the stress in a tankless water heater occurs. For this reason, the Noritz Tankless Water Heater utilizes a heat exchanger with 25% thicker copper piping. This helps to ensure the heat exchanger’s quality and durability is not compromised. How Often Does A Tankless Water Heater Need Servicing? It is recommended by the manufacturer including Navien to have the tankless maintained once per year in order for the heater to still be covered under warranty through them.